The sky is the limit. We offer a wide array of products for the aviation industry: including manufacturing and transport equipment, assembly stations, aircraft parts and equipment necessary for aircraft assembly. We remain committed to improve and to continuously perform flawlessly in all categories of our work. Nonetheless, according to our clients, we stand out for delivering solutions to the most unique of challenges within the aviation sector. We like things to move forward and to put them in motion. Compact components, aircraft fuselage and sub-assembly parts, need customized supporting and transporting frames within the manufacturing plants, and while being transported from point A to B by land, sea or by air. 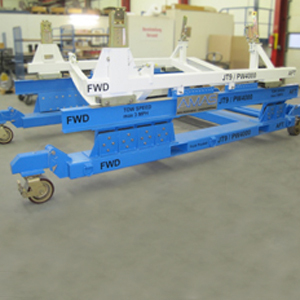 Our customized transportation racks, needed within the manufacturing plant, as well as those needed for maritime shipment and other type of shipments include: Maritime transporting frames for the A380 fuselage and the A400M Wing-Jigs. Within the manufacturing plants, we have been responsible for producing frames for the single-aisle fuselage. In order to ensemble aircraft and aircraft components, appropriately equipped assembly stations are required. Our carefully designed assembly stations include access-tracks, security mechanisms, lifting systems and indispensable manuals, including imagery for precisely setting the stage to put the pieces together. In addition, our laser tracker delivers the required precision for the building sites. For aircraft maintenance special tools and technical devices are required. Besides having executed many projects around aircraft production, we have also more recently, expanded our portfolio and delivered tools for aircraft maintenance. Some products within this scope include: variable-height stairways, on request including freight elevator, diverse hoist mechanisms and the most various tools. Recently, we have successfully rebuilt an engine cradle for one of our certified partners. 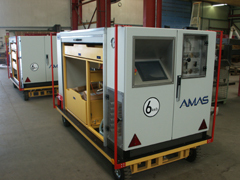 Water trucks for inspection, controlling and purifying of waste water used during the single-aisle production site. Pipe Leakage Test Vehicle to identify leakages in pipe systems, including air-conditioning systems. We have developed devices for conductivity testing within the wing’s wind tunnel. Which allows wings to be adjusted to obtain optimal testing results. The wide scope of our testing devices includes for example: developing the framework and mechanical components of a Helicopter simulator or the reproduction of the fuselage of a cargo aircraft and all necessary add-ons required for training.